A 67-year-old female presented with a several month history of painless enlarging right periorbital growths. Examination showed multiple nontender subcutaneous nodules superior to the right eyebrow. Magnetic resonance imaging and incisional biopsy confirmed subcutaneous marginal zone B-cell lymphoma of mucosa-associated lymphoid tissue (MALT). Subcutaneous involvement sparing the epidermis is a rare presentation in patients with prior noncutaneous marginal zone lymphomas. Recent studies have demonstrated that subcutaneous dissemination is associated with MALT lymphoma of the breast and ocular adnexa. Systemic workup is therefore critical in patients who present with subcutaneous MALT lymphoma. Radiation therapy has proven to be effective in cutaneous marginal zone B-cell lymphomas. Marginal zone B-cell lymphoma of mucosa-associated lymphoid tissue (MALT) has a propensity for extranodal organs due to interactions of mucosal structures such as α4 β7 integrins with endothelial venules. 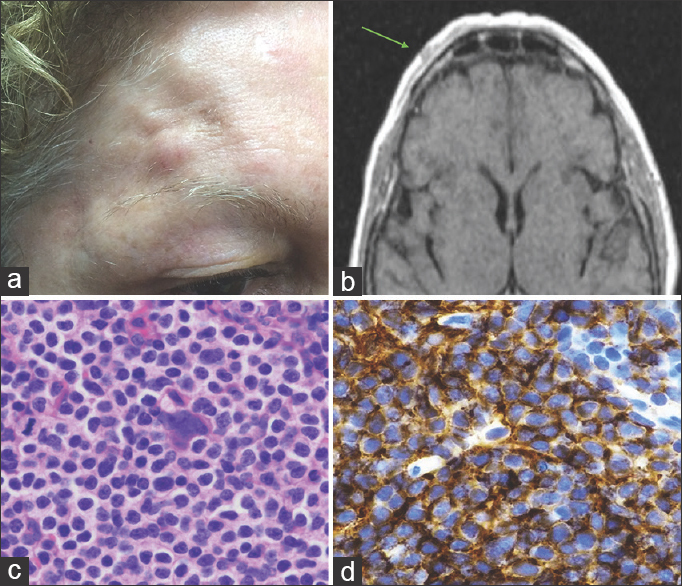 Primary cutaneous marginal zone B-cell lymphoma (PCMZL) is a low-grade MALT lymphoma that originates in the skin without extracutaneous disease and represents 10% of cutaneous lymphomas. Most present as multifocal lesions on the trunk and extremities but uncommonly (~10%) in the head and neck region, which is a contrast from cutaneous follicle center lymphomas. An association with Borrelia burgdorferi infection has been investigated, with antibiotic use having a mixed effect on the regressions of lesions. A 67-year-old female with a past history of only well-controlled hypertension presented with a several month history of painless enlarging right periorbital growths. She denied any past similar lesions or any history of cancer. Examination showed multiple nontender subcutaneous nodules superior to the right eyebrow [Figure 1]a. Magnetic resonance imaging confirmed the superficial location of the lesions [Figure 1]b. Since the differential diagnosis was broad including both benign and malignant entities; a biopsy was suggested. Incisional biopsy revealed a dense infiltration of the dermis by monotonous small lymphocytes [Figure 1]c that stained with CD20 and CD43 [Figure 1]d confirming a diagnosis of extranodal marginal zone B-cell lymphoma of MALT. Systemic workup with full body positron emission testing was negative, and radiation therapy is currently planned. Subcutaneous involvement sparing the epidermis is a rare presentation in patients with prior cutaneous marginal zone lymphomas. Recent studies have demonstrated that subcutaneous dissemination, particularly in the head-and-neck region, is associated with MALT lymphoma of the breast and ocular adnexa., Systemic workup is, therefore, critical in patients who present with subcutaneous MALT lymphoma. The proposed hypothesis is a specific homing pattern for these ectodermal-derived organ systems. The possible association of hepatitis C infection with subcutaneous MALT also suggests a chronic antigenic stimulation component to its development. Patients with subcutaneous dissemination usually have similar prognoses compared to those with extranodal lesions. PCMZLs are usually treated with radiotherapy, excision, and possible chemotherapy if multifocal. The dosage of radiation is still unknown, with success occurring at 3000-rad doses. Chemotherapy with agents such as chlorambucil has proven safe and effective, but multiagent use does not appear superior to preventing cutaneous relapses. Subcutaneous MALT lymphoma can rarely present as painless periorbital nodules and clinicians should include this entity in their differential diagnosis to allow for timely diagnosis and management. Jonak C, Troch M, Kiesewetter B, Lukas J, Müllauer L, Jäger U, et al. Subcutaneous dissemination pattern in extranodal marginal zone B-cell lymphoma of mucosa-associated lymphoid tissue lymphoma. Haematologica 2012;97:766-70. Lima M. Cutaneous primary B-cell lymphomas: From diagnosis to treatment. An Bras Dermatol 2015;90:687-706. Hoefnagel JJ, Vermeer MH, Jansen PM, Heule F, van Voorst Vader PC, Sanders CJ, et al. Primary cutaneous marginal zone B-cell lymphoma: Clinical and therapeutic features in 50 cases. Arch Dermatol 2005;141:1139-45. Cerroni L, Zöchling N, Pütz B, Kerl H. Infection by borrelia burgdorferi and cutaneous B-cell lymphoma. J Cutan Pathol 1997;24:457-61. Gerami P, Wickless SC, Querfeld C, Rosen ST, Kuzel TM, Guitart J, et al. Cutaneous involvement with marginal zone lymphoma. J Am Acad Dermatol 2010;63:142-5. Paulli M, Arcaini L, Lucioni M, Boveri E, Capello D, Passamonti F, et al. Subcutaneous 'lipoma-like' B-cell lymphoma associated with HCV infection: A new presentation of primary extranodal marginal zone B-cell lymphoma of MALT. Ann Oncol 2010;21:1189-95.